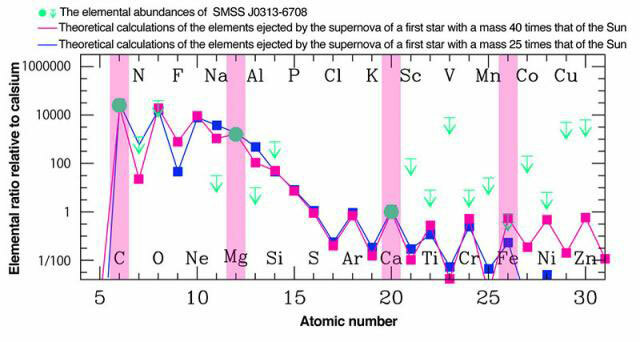 (Nanowerk News) A team of researchers, led by Miho N. Ishigaki, at the Kavli IPMU, The University of Tokyo, pointed out that the elemental abundance of the most iron-poor star can be explained by elements ejected from supernova explosions of the universe’s first stars. Their theoretical study revealed that massive stars, which are several tens of times more immense than the Sun, were present among the first stars ("Faint Population III supernovae as the origin of the most iron-poor stars"). The presence of these massive stars has great implications on the theory of star formation in the absence of heavy elements. Iron-poor stars provide insight about the very early universe where the first generation of stars and galaxies formed. The recent discovery of the most iron-poor star SMSS J031300.36-670839.3 (SMSS J0313-6708) was big news in early 2014, especially for astronomers working on the so-called “Galactic archaeology”. When the universe first began, only light elements such as hydrogen and helium existed. As these first stars ended their short but wild lives, the universe became enriched with heavy elements, which are essential to form the materials found on Earth, including humans. Hence, iron-poor stars are much older than the Sun, and were born when the universe only contained trace amounts of heavy elements. SMSS J0313-6708 is the most iron-poor star ever found. Its spectrum lacks iron absorption lines. The estimated upper limit for its iron abundance is about a ten-millionth of that of the Sun, and its iron content is about hundred times lower than the previous record for the most iron-poor star. “We received the news of the most iron-poor star with a great excitement,” Ken’ichi Nomoto at the Kavli IPMU says, “since this star may be the oldest fossil record and may elucidate the unknown nature of the first stars.” The first stars, which formed in the early universe, likely had a large impact on their environments. For example, the strong ultra-violet light emitted by the first stars helped ionize the early universe. In addition, their supernova explosions ejected heavy elements that have helped form subsequent generations of stars and galaxies. Due to its unusual chemical composition, some astrophysicists have speculated that SMSS J0313-6708 was born from the gas enriched by a first star, which has a mass 60 times that of the Sun, and synthesized a small amount of calcium through a special nucleosynthesis. On the other hand, Ishigaki’s team focused on its very large carbon enhancement relative to iron and calcium. Previous studies by Nozomu Tominaga at Konan University/Kavli IPMU suggested that such a feature is consistent with a supernova in which the synthesized elements fall back. However, the question was whether this scenario can also explain the most extreme abundance pattern in SMSS J0313-6708, the most iron-poor star. The team compared the observed abundances and theoretical calculations of the elements ejected by the supernova of first stars with masses 25 and 40 times that of the Sun. They concluded that the observed abundance pattern can be reproduced if stars with those masses undergo a special type of supernova in which most of the ejected matter falls back to the central remnant. A highly asymmetric explosion involving a jet-like feature should produce this type of supernova. As a consequence of the jet, iron and calcium, which are located deep inside massive stars, are ejected along with the jet, but a large fraction of the ejected material falls back along the equatorial plane. Because carbon is largely contained in the outer region, it is almost entirely ejected without falling back. This model successfully explains the low abundance of calcium, the non-detection of iron, and the high abundance of carbon observed in SMSS J0313-6708. “If such supernovae are actually possible,” Nomoto says, “the result supports the theoretical prediction that the first stars could be typical massive stars rather than monster-like objects with masses more than several hundred times that of the Sun.” Since heavy elements play a role in star formation through the gravitational pull of interstellar gas, the first stars, which formed without heavy elements, should display quite different characteristics compared to what is typically observed in the present Milky Way Galaxy. In particular, without heavy elements, some researchers have suggested that stars could be as massive as a few hundred times that of the Sun. The presence of stars much less massive than such monster-like objects among the first stars may affect the theory of star formation in the absence of heavy elements. In future studies, researchers should employ simulations for the formation of the first stars in the early universe that reproduce the present result.